Aberdeenshire, in the northeast of Scotland, is full of surprises. There is so much to see and do, no matter what the weather is like, which season you visit, or whatever your budget. Some attractions are well known, but others are a little bit more unusual, like the six options here. When people think of wildlife watching they do not usually think of doing so within a city, much less marine wildlife watching. However, Aberdeen regularly rewards dolphin watchers with remarkable views of the resident pod of bottlenose dolphins from the shore. Head to Torry Battery and simply watch and wait, perhaps with an ice cream on a hot day, or local fish and chips if it is not so warm! You may not always be guaranteed dolphins, but when you do see them the experience is memorable with the salmon they hunt often leaping out of the water to evade capture and the dolphins following! The Glenesk Folk Museum is situated in Angus and was one of the first museums in the UK to use living history as a means to educate visitors. Over the years the collection grew and the museum is now housed in a recently refurbished, purpose-built centre. Here you can learn all about what it was like to live in this corner of Scotland in a far more interactive and hands-on experience than many museums – dress up in period clothing and play with the toys your ancestors would have known. The Burn O’Vat is a fascinating natural feature, but it is also a part of the legend of Rob Roy MacGregor. This is essentially a giant hole, carved out by the actions of melt-water and rocks when the ice sheets melted. Accessed by walking through an almost-hidden natural passageway it is not hard to see why myth has connected Rob Roy to this place — especially since historical documents can prove it to be the hideout of a cattle thief in the 17th century, who was also called MacGregor. There is a nearby visitor centre, open from Easter to October. Visitors to Scotland are often surprised to learn just how many ancient standing stones and circles cover the country. Some, like the Ring o’Brodgar are internationally famous while others, like those in Aberdeenshire, are less well known. Incredibly, there are around 100 such sites in the county, including those at Kirkton of Bourtie, Easter Aquhorthies, and Tomnaverie. These sites are thought to date from the Bronze Age and were most likely erected at a similar time to Stonehenge. The idea of voluntarily going to prison may seem a bit odd, but the experience is well worth it! Opened in 1888, Peterhead Prison Museum was Scotland’s first convict prison and stayed in use until 2013. Known as ‘Scotland’s Alcatraz’, and also often referred to as a place of no hope, Peterhead has now been turned into a fantastic visitor experience which opened in 2016 and has garnered excellent reviews. Here you can learn all about the history of the prison, from early days right up to the riot in the 1980s that was only ended by the intervention of the SAS. Aberdeenshire is dotted with many castles, some still lived in, others severely ruined. 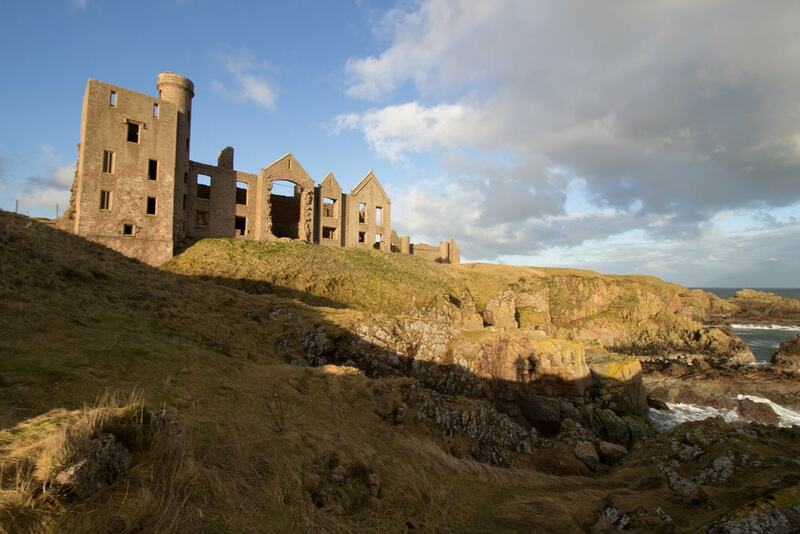 Compared to some, New Slains Castle is a relatively modern building, originally constructed around the end of the 16th century and rebuilt between 1836 and 1837. In 1895 Bram Stoker visited the area and two years later published his most famous work, Dracula. The castle is thought to be the inspiration for the vampire’s own home. Today it is ruined, eerie, and roofless, perched on a cliffside overlooking the North Sea.